It is so nice to be finished with a couple of recent watercolor paintings but they weren’t without their obstacles. 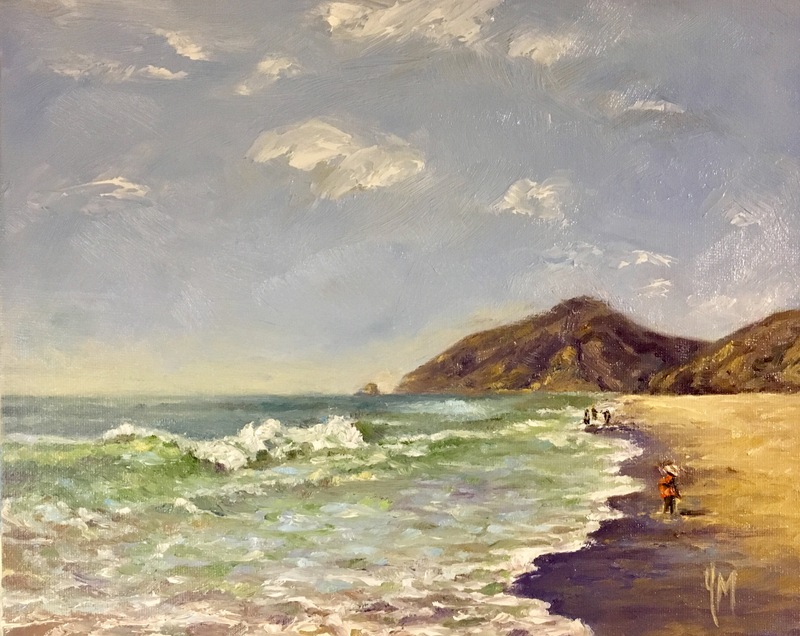 I generally make a working sketch when a project is complicated but I did not examine my sketch of the “Ocean Painters” carefully enough to work through the difficult shade areas or take a good look at the “bench” when beginning the painting. Artists who have worked with watercolor know, once the color is down, it is difficult to make changes afterward. I took my chances and made some changes anyway and for the most part, it worked out. The palm tree painting was straight forward but my “Ocean Painters” will need a bit of tweaking here and there but is basically done. I continue to learn something new every day and definitely with these two paintings. Deadlines are so uninspiring but they do cause me to schedule my days to make the most out of the time I do have to be creative. As a rule, I try to stay away from deadlines but I am working on two paintings for a show in Oceanside, CA – due date: June 30th. No pressure – HA! My watercolor paintings have layers and layers of color and right about this stage, I am having doubts and being super critical of my work. I have no idea why, but it’s a battle I have with each watercolor painting. Now that I am back in my studio, it is time to finish up a couple of watercolor paintings and work out the details for a couple of more. From early in my high school days to now, I have always loved working in the controlled environment of my own room as opposed to “En Plein Air”. Painting outside is fun and though I am getting to paint outside more, the illustrator in me needs to work on paintings at any hour of the day without worrying about the changing light. I also tend to work on several paintings at a time and below is a sketch of a painting I plan to do in watercolor as well as oil. Dove Springs is a favorite area for so many So Cal people to motorcycle ride and as we made our final stop before getting home, we were able to watch the Memorial Day crowd of weekend warriors get themselves settled for what promised to be an amazing time to be out in the desert. As we enter the summer months, I wish you all a safe and blessed time no matter where the days find you. I photographed this painting in natural morning light and it makes such a difference! My previous post showed so much yellowing (shown below)plus I made a few minor changes.